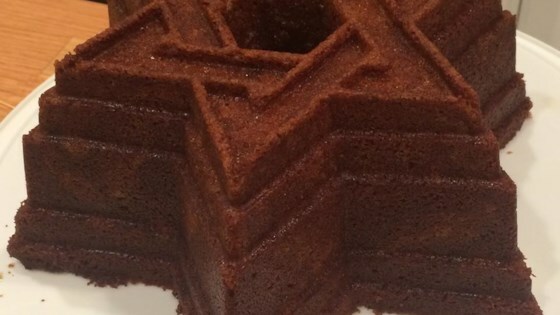 "Spiced fragrant honey cake is a tradition on Rosh Hashanah (the Jewish New Year, which generally falls in September). Unfortunately, most honey cakes turn out to be dry, brick-like things, inedible except with a hot beverage. Some call honey cake the fruitcake of the Jewish people. BUT NOT THIS ONE! This cake is genuinely moist and yummy. It will serve about 12 guests at a holiday meal, but I promise that your family will chisel away at it until it's gone before the morning comes." Place an oven shelf in an upper position in oven, and preheat oven to 350 degrees F (175 degrees C). Spray a 10-inch fluted tube pan (such as a Bundt(R) pan) with cooking spray. Some people drizzle with white icing and slivered almonds. If baking in a 9x13-inch baking dish, bake for 40 minutes. I made this and did not enjoy the taste at all. It was quite moist, as advertised. Maybe it's just not my kind of cake. Hi folks -- Just a comment on my recipe: The whiskey is strictly OPTIONAL! Hope you enjoy! Great cake, both in taste and texture (it's like a spice cake). I find, however, that only 1/4 C each of white and brown sugar is sufficient.